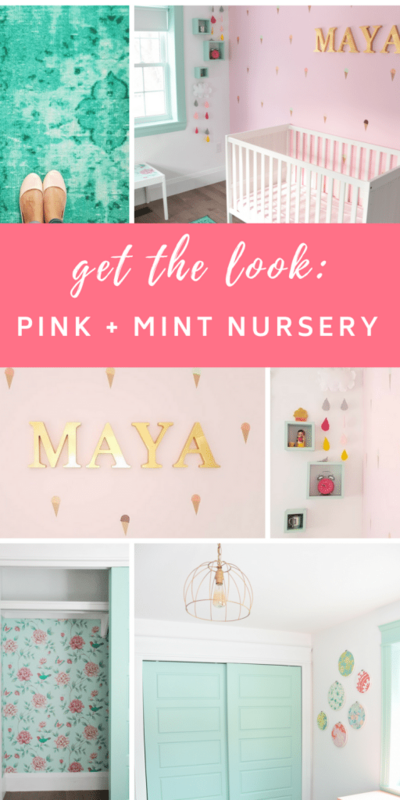 Our daughter, Maya, is a cheerful and sweet girl, so I was super excited to create this mint and pink nursery for her! The goal was for the room was to be bright, playful, and a space that could grow with her as she moves from baby to toddler to big kid. 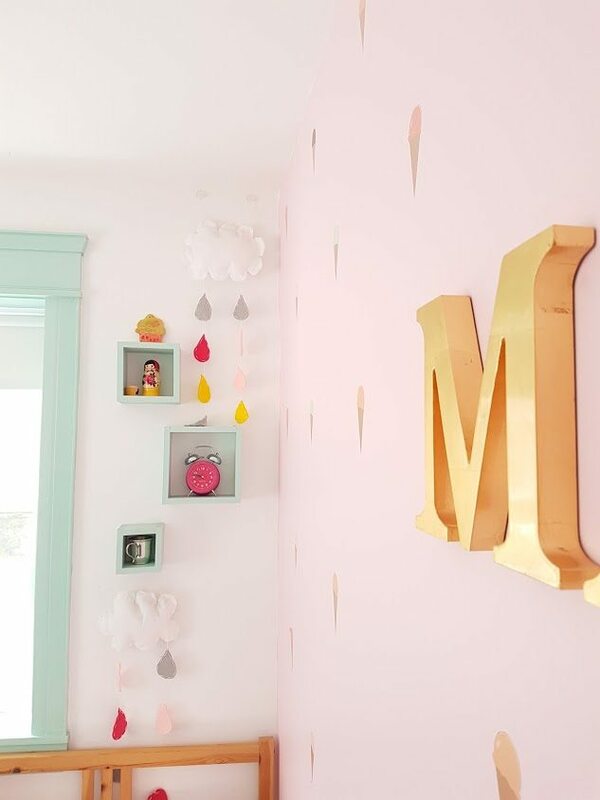 The room has a pink and mint scheme (her mama’s fave colours! ), with hits of gold. 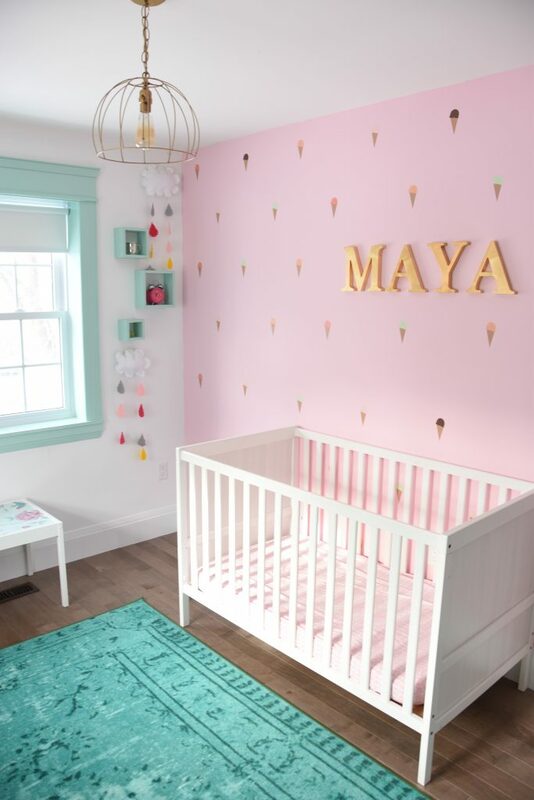 The pink wall with ice cream decals was the first project we did in the room, and then everything else was built around that. 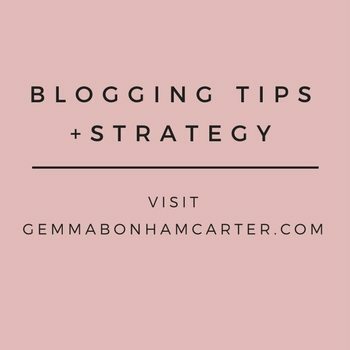 I had fun choosing out all the items – a mixture of new purchases and DIY projects. Basically if I could make it pink or mint, I did! 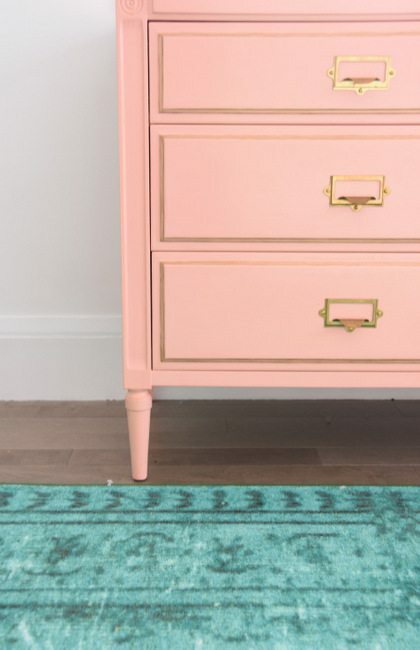 The rug is an overdyed turquoise. I like that the pattern is subtle so it isn’t crazy distracting to everything else going on in the room. 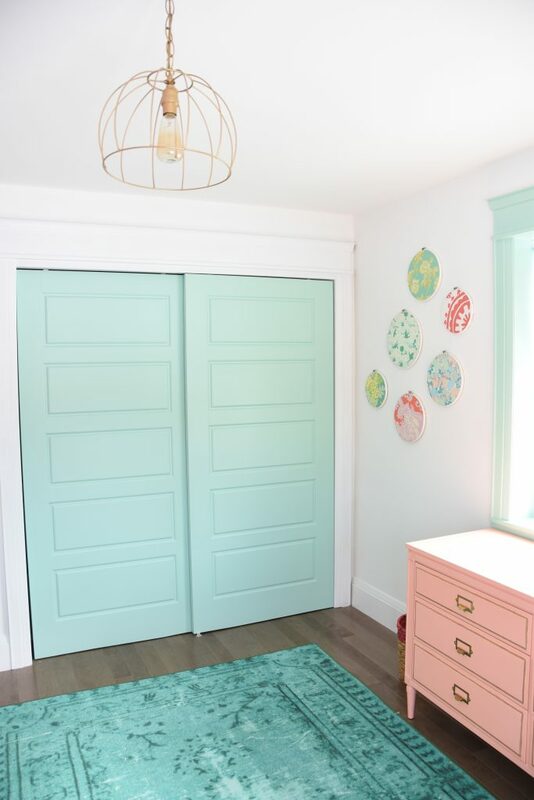 Painting the window trim and closet doors a minty hue gives the room a really playful vibe. I liked keeping some of the wall white, so that the room would feel bright, so this was a way to still bring in colour. 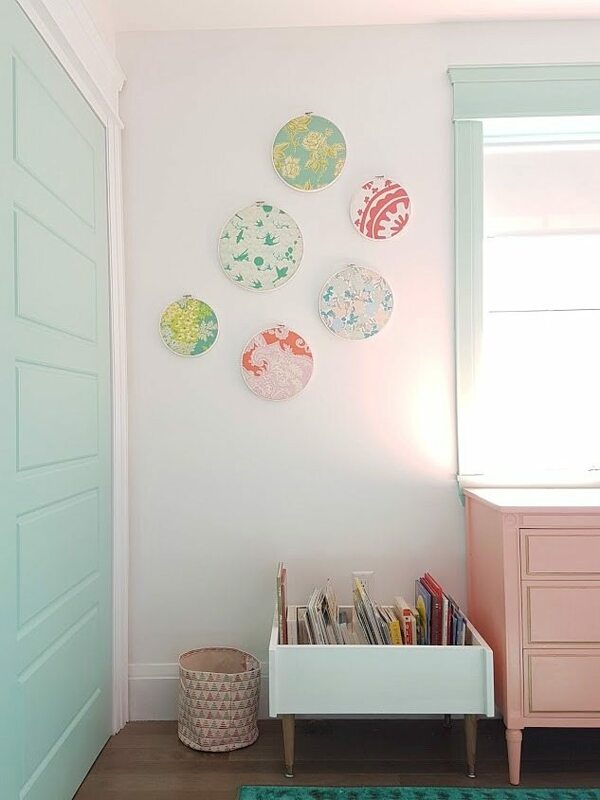 The art on the walls is a mixture of art prints, DIY projects (like the fabric embroidery hoops! ), and shelves. 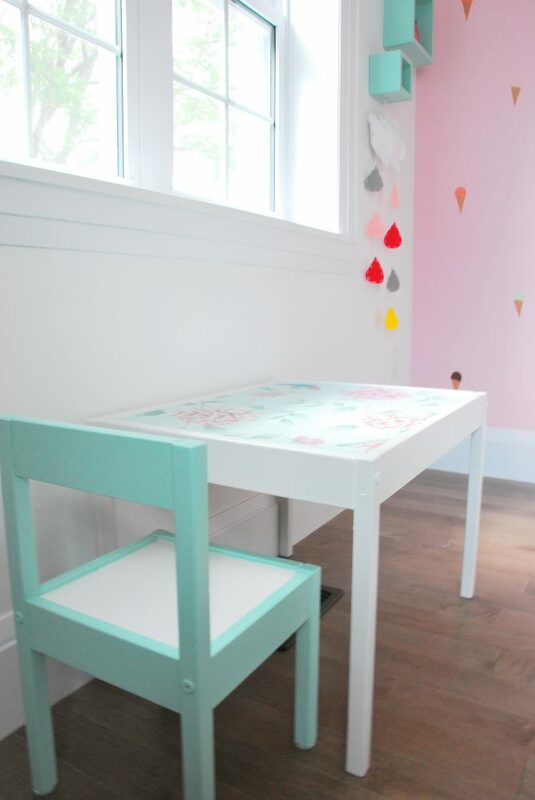 Doing this IKEA Latt Table Hack turned out so cute! The DIY felt raindrops were another cute handmade touch. And those box shelves are a great way to have a more 3D art installment. I just painted some plain wood cube shelves, but I LOVE these little house ones from Wayfair. Would’ve grabbed those if I had seen them! 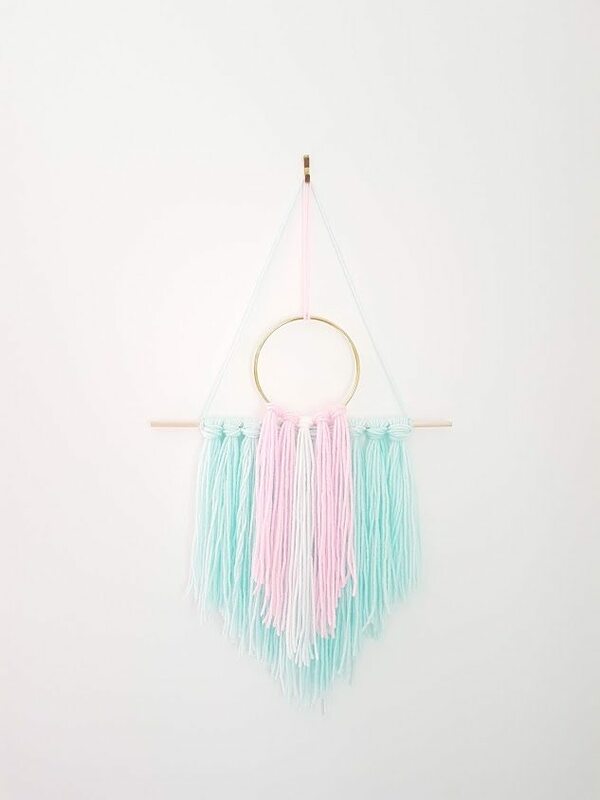 And this DIY yarn wall hanging was super easy and fun! My tip for staying on budget when doing a bedroom is always to just paint an old dresser instead of shelling out hundreds of bucks on a new one. Find an old wood dresser at a yard sale or a hand-me-down (I’ve been known to garbage pick dressers on the regular! ), paint it a bright colour, add some fun new hardware, and boom. An amazing looking piece that no one else will have! 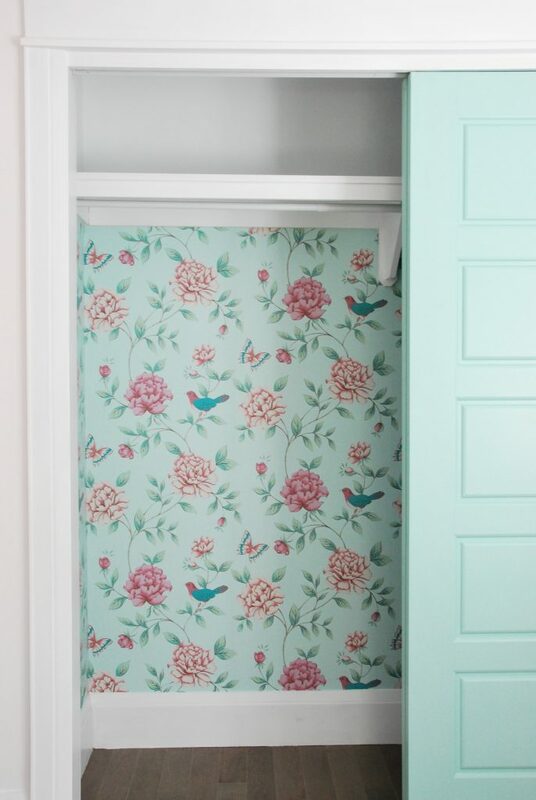 Closets are important in kids rooms to help keep all the clutter and clothes organized. 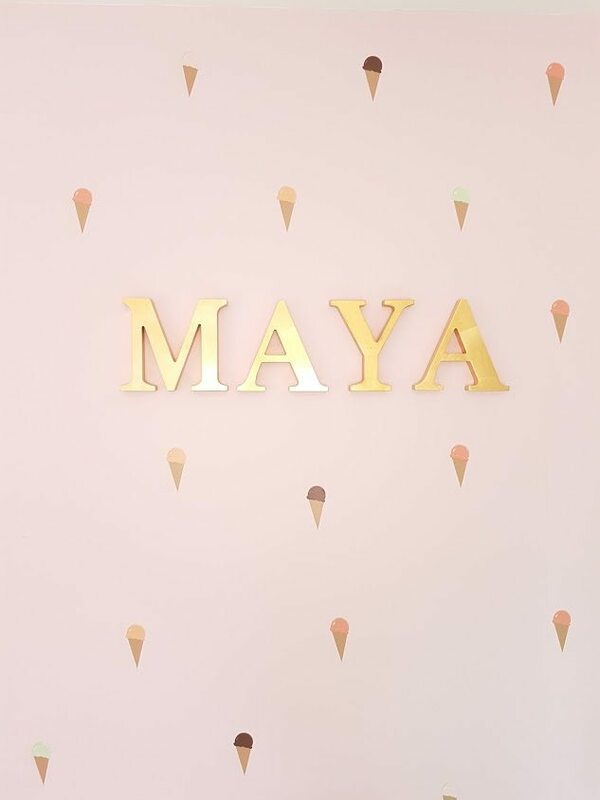 We did something fun with Maya’s by wallpapering the inside. I LOVE how it turned out! I love the way this room turned out (and luckily Maya does too)! If she isn’t careful, mama is going to want to move right in. Ha! Wow! I really like the rug you picked! I’ll definitely check out RugsUsa.. still need a rug for the little one! Question for you.. do you put something under the rug so it won’t move around? 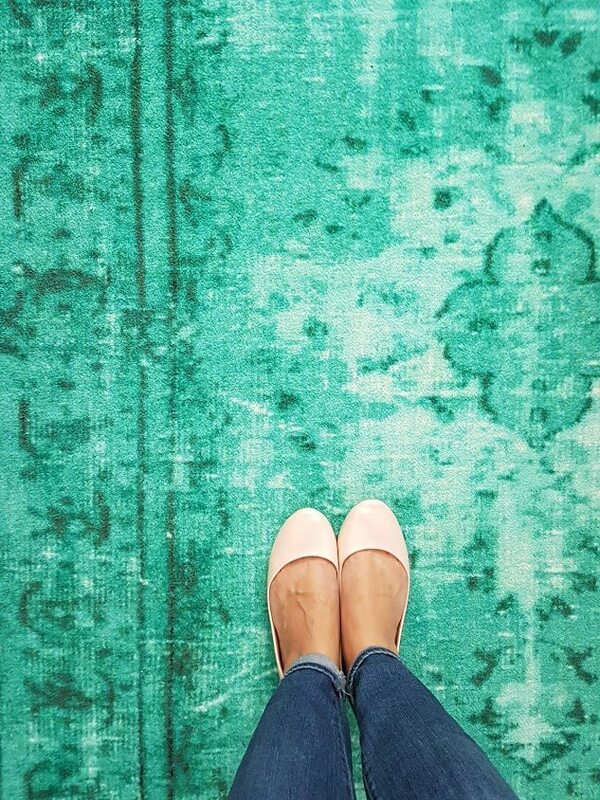 I’m still on the hunt for a good pad for some of the rugs we do have that don’t have a built-in anti-slip! I have found decent ones at HomeSense before, and have also ordered the rug pads with my RugsUSA rugs usually. What paint color did you use on the window frames? It looks great! It’s PARA paints “baffling behavior” — my fave mint! Where did you get the light fixture I didn’t see a link in your post? 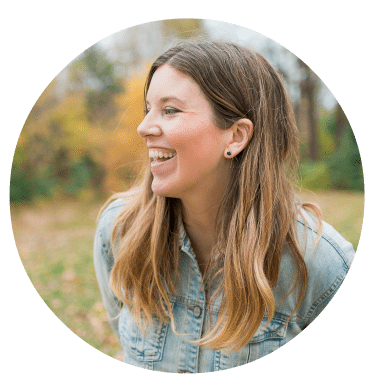 I was wondering what inspired you to paint the window trim? I had never consideted it because I’ve never seen it done well lol but I love it here! Dying to know whay inspired your decision! Just wanted to bring some of that colour into the room without it going all over the walls, I guess! And because of the setup of the room right now (and budget), curtains weren’t an option – so painted trim was a fun alternative to dress them up! Such gorgeous colors. I wanted to let you know that I am featuring this in a nursery roundup if you don’t mind. Hi! I absolutely LOVE everything about this nursery! Would you be able to tell me the name of the paint colour you used on the closet doors please? I just adore it and would like to use it on my daughter’s playhouse. Thank you so much!!! I love the colors here!! I am wanting to do my daughter’s walls white. What is the name and brand of the white you use?